The Vortex Demo - Previously Lost To The Mists Of Time! Now Those Fan-Based Repton Infinity Games Are Available With Full Source Code! HeadFirst PD - Internet Scores Result At Last! The Internet may have helped to kill off the monthly disc user groups way back when - but it certainly shows its worth when you are tracking down rare software. And as if the regular new acquisitions of this site were not enough proof of this, the finding of a whole new library surely is. And particularly when that library was one of the most lamented losses of the Acorn Electron World! Yes, after years of appealling, sighing and begging for copies of any HeadFirst PD discs in existence, one of its co-founders, Mr. Gareth Boden, discovered our site one fateful day in November 2007, retrieved his back-catalogue of discs and donated them to us lock, stock and barrel. The HeadFirst PD section of the site has therefore been fully updated to make available all those titles previously thought 'lost forever'. HeadFirst PD was originally set up at the very end of the Electron's life (late 1992) and originally supplied its wares by mail order for £1 per disc. The discs do appear to have "evolved" from the initial catalogue though, with full menu systems and instructions added mid-1993, when an updated catalogue was produced. It is these later versions which have now been unearthed. As was the nature of public domain software, many programs written by HeadFirst PD found their way onto other PD libraries' collections - and vice versa. The result is that although the catalogue is newly uploaded as of today, many of the programs themselves are duplicated elsewhere. There are though a whole swathe of new additions scattered throughout them, including 32 taxing screens for 4th Dimension title White Magic, and a rather spiffing 8-bit demo complete with scrolly message and two pieces of music, called Vortex. And if discs galore aren't enough to have your 8bit taste buds watering, remember that scans of the original HeadFirst PD paper-based catalogues continue to be available in the same section. Riding on the back of last year's release (and our review) of PPM2BBC, it was noted by quite a few people that by using the utility in conjunction with screenshots from other emulators effectively now allowed games programmers to 'rip' the sprites directly from any game in preparation for a BBC/Electron equivalent, hence opening up the conversion markets to those people who did not necessarily wish to spend a lot of time laboriously copying the sprites by hand. By the end of December 2007, quite a long thread had been established over at Stairway to Hell on precisely this, with suggestions that major games might soon be heading towards the PD archives. And, not to give away too much, but one user in particular seemed keen on ensuring a certain version of a certain Ocean game (right) made it here by the end of 2008...! It's always a joy to discover the more obscure magazines that existed for the BBC/Electron. 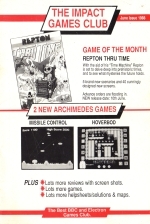 The Impact Games Club, which has had its own section featuring downloadable cheat sheets for a number of years, recently also made an appearance in the magazine scans section with the discovery of five brochures (circa 1988-1990) featuring full reviews on a number of BBC/Electron games. One would wonder, however, at how impartial the Impact Games Club with its scoring system was - when it was offering for sale on one page the very games that it was reviewing on the opposite one! As if to prove the point, its own games: Orbital and Zenon all have praise heaped upon them by the bucketload. However, the strategy Impact seemed to adopt was only to review good games! Hence there are quite a number of alternative takes on some of the later games that were released on the BBC/Electron during this period, even if partiality is somewhat dubious. The new section of the website devoted to the fanzines of The Impact Games Club can be visited here.